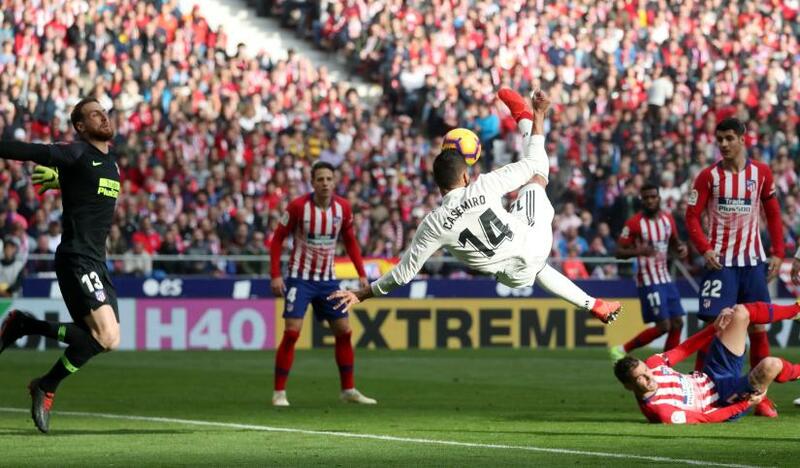 Real Madrid barged their way back into the Spanish La Liga title race with a 3-1 victory over Atletico Madrid in a feisty derby at the Wanda Metropolitano on Saturday. "La Liga is there to fight for, there are a lot of points to win and any team can make your life hard," Real captain Ramos said. A vibrant atmosphere at the Wanda Metropolitano also carried an undercurrent of anger as Atletico fans threw stuffed toy rats at Thibaut Courtois's goal. It was the Belgian goalkeeper's first return to play his former side Atletico since signing for Real Madrid and he endured an uncomfortable afternoon. Atletico started brightly with Griezmann firing into the side netting but Real moved ahead in the 16th minute when Casemiro scored a spectacular overhead kick after a corner was flicked on to him. Atletico levelled when Griezmann slotted home coolly through Courtois's legs after Correa played him in, with home fans enduring an agonising wait while VAR verified that the French striker was onside. The VAR system was referred to again when Jose Gimenez brought down Vinicius Jr. on the edge of the box, with referee Xavier Estrada Fernandez deciding the foul continued into the area. Ramos smashed home from the spot to send his side back into the lead just before halftime and Bale netted the third to seal an impressive victory for Real and a painful loss for Atletico who had previously conceded just four goals at home. "We lost today, we must look forward and keep working, there is still a lot of fight for," said Atletico skipper Diego Godin. "There is a long way to go, we have to do our part and the rest is not in our hands."